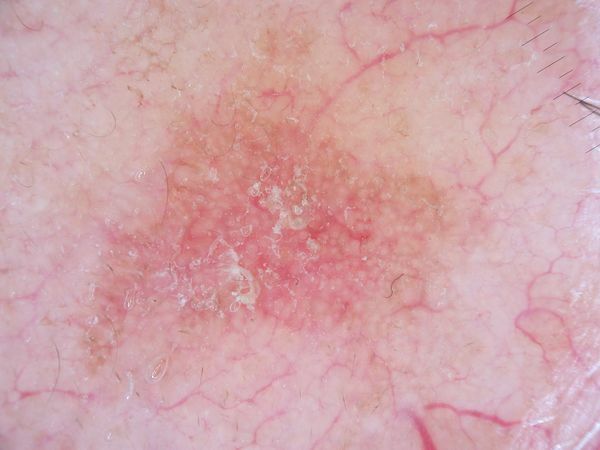 Description Describes dermoscopyThe examination of [skin lesions] with a 'dermatoscope'. This traditionally consists of a magnifier (typically x10), a non-polarised light source, a transparent plate and a liquid medium between the instrument and the skin, and allows inspection of skin lesions unobstructed by skin surface reflections. Modern dermatoscopes dispense with the use of liquid medium and instead use polarised light to cancel out skin surface reflections. of the strawberry patternReddish pseudo-network (erythema and wavy fine vessels) around hair follicle openings which are accentuated with a white halo appearance as seen in actinic keratosisActinic keratosis (also called solar keratosis and senile keratosis; abbreviated as AK) is a pre-cancerous patch of thick, scaly, or crusty skin. Strawberry pattern, Actinic keratosis Strawberry pattern – cite! Strawberry pattern (message) Strawberry pattern – participate! 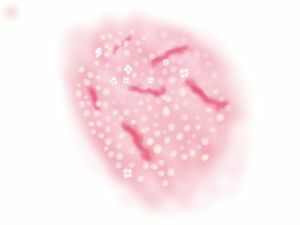 The term “strawberry pattern” refers to the distinctive dermoscopic appearance of facial actinic keratoses, consisting of a pink/red pseudonetworkA structureless pigment area interrupted by non-pigmented adnexal openings with blurry vesselsThis glossary term has not yet been described. coursing between hair follicle openingsThis glossary term has not yet been described. filled with keratotic plugs .